Dr. Patricia Makokis,(Ed.D.) is acclaimed as one of Canada’s most outstanding Indigenous leaders and experts. She is an internationally renowned speaker and well known for her expertise on multiple topics related to the Canadian Indigenous perspective. Patricia focuses her work on how to create solutions through identifying with the Truth of the past, present and future challenges for Canadians and First Nation peoples. Her dynamic experience and education has led her to help Canadian individuals and organizations to understand the Indigenous perspective, and also to help First Nation groups become stronger, united and focused on equality for health, education, careers and opportunity. Dr. Makokis has spoke, consulted and assisted many different industries throughout her career. She continues to consult and speak for a wide variety of organizations ranging from Provincial and National Governments, Healthcare Groups, Education/Teachers, Professional and Trade Associations and to some of the world’s largest Corporations. She has worked as an academic for 25 plus years as a front line Teacher, Vice Principal, Principal, and Professor. Dr. Makokis was appointed to the Judicial Council of Alberta in February, 2016. Additionally, she was recently appointed by the Saddle Lake Chief and Council to the Saddle Lake Cree Nation Child Welfare Board. She is a leading activist and is at the forefront of many political and social movements to fight for change including the national Idle No More Movement. Patricia’s approach is to bring Canadians and Indigenous peoples together with a strong focus on solutions. She believes that in order for real change to occur, it starts with the education of Indigenous and Canadian peoples, so that there is greater understanding, knowledge and expertise to help facilitate change. Patricia Makokis has written and developed leadership courses as part of a Bachelor’s Degree in leadership for Blue Quills First Nations College that transferred to many Western Canadian Universities. Additionally, she has worked on national health initiatives including Promoting Mental Health for Canada’s Indigenous Peoples for the Royal College of Physicians and the Indigenous Physicians Association of Canada. She developed and established the curriculum that is standard across Canada for the Community Wellness Certificate offered by the Nechi Training Institute. Patricia also created and produced numerous academic courses in Management, Organizational Change and Wholistic Leadership and was a main contributor to rewriting the University of Alberta Indigenous Studies curriculum. Dr. Patricia Makokis is an authority on Indigenous values and Indigenous/Canadian relations. She is passionate to help facilitate the development of Indigenous wellness (economic, health, social, education); fostering positive business/industry relations between Indigenous people and industry / business (relational leadership) and building Nations (one person at a time). She has received the 2014 Aboriginal Role Model of Alberta (Community Development), 2009 Alumni leadership award at the University of San Diego, the 2002 Seekers & Storytellers – Aboriginal Role Model of the Year and the 2002 Queens Golden Jubilee Medal Award. Patricia’s informative, uplifting and authentic presentations engagingly address the challenges facing First Nation communities. Dr. Patricia Makokis is an exceptional addition to groups and organizations that want a better future and understanding for Indigenous Canadians. Her story is one of leadership, resilience and hope and never giving up on dreams and your goals. She is humourous, down to earth and passionate in everything she does. She is an author, speaker and a pioneer for Indigenous education, health, values and traditions. Patricia Makokis addresses numerous audiences across Canada and around the world in the fields of education, social justice, social programming, community development, leadership and Indigenous health. Dr. Patricia Makokis is the mother of two of Canada’s leading experts for Indigenous values, traditions, law and Indigenous health. Janice Makokis has recently consulted for the Canadian Truth and Reconsiliation Commission and co-chaired the North American Indigenous Peoples Caucus (NAIPC) at the United Nations. James Makokis is a medical doctor with one of Canada’s leading practices for transgender and LGBTQ2 Canadians. He is also a leading expert for health access and Indigenous health programs. Either of them can accompany Patricia to deliver a dynamic presentation on wide range of topics. The Makokis family represents so many voices across Canada. They are heavily invested in the traditional values and Indigenous practices. They are all role models and representatives of the change needed to become one nation. Their perspectives are unique and are at the forefront of understanding the cycle of where we are now in relation to the past and what we need do to create a new future for all of Canada. Patricia Makokis has addressed numerous audiences across Canada and around the world in the fields of education, justice and health. She is in demand as an authority and an articulate representative to bring insights for dealing with the past, present and future for Indigenous people. From developing future strategies to addressing the past, she believes in a future where Canadians and Indigenous peoples are working together to create a better future together. She brings light how individuals, communities, organizations and governments all play a role in developing a future that acknowledges our past so that we can focus on the Truth, which then allows us to focus on solutions. She can speak to any audience and can deliver a dynamic presentation that will provide audiences with a new prospective, new understandings and tools to make a difference. Patricia Makokis’ career speaks for itself. She is highly respected across Alberta for her knowledge, abilities and her passion to help First Nation Communities become whole again. She works closely with many different reserves, provincial and government agencies, healthcare systems and communities as a consultant. She is relied on by these organizations for her expertise. Patricia is dynamic, educative, funny and always receives high praise for her presentations. The Makokis Family can draft up a speaker series presentation specifically for the conference and your association. This half day session would include all three speakers presenting with each other, or each speaker can draft a presentation to follow up and expand on the other member of the Makokis family’s presentations throughout the session. Each member of the Makokis family has a very unique perspective on First Nation Matters and important information for all Canadians and will be focused for teachers and educators in Alberta. This speaker series addresses the history, current situation, and future of Indigenous culture in Canada. It includes practical solutions for any matters related to First Nations in Canada. A truly unique presentation, there are not many sessions or presenters that can address the amount of issues that the Makokis family can. This presentation is customized to each organization and association. Dr. Patricia Makokis, (Ed.D.) is acclaimed as one of Canada’s most outstanding Indigenous leaders and aboriginal expert. Her warm speaking style engages audience everywhere. She uses humour and relevant anecdotes to make her points. Dr. Makokis is internationally and nationally renowned. She is in demand as a speaker across Canada not only because she is an expert on Indigenous matters, but also because of her articulate and humourous presentations. The vital and necessary guiding principles of her Indigenous values are deeply rooted in the worship and respect for the land and the environment. She intimately knows the history of indigenous peoples and she practices their philosophy and beliefs in everything that she does. Dr. Patricia is authentic. Residing on the Saddle Lake Cree Nation She is a proud First Nation representative and member of the indigenous community. She is passionate about who she is, the knowledge she possesses, and the groups and individuals she represents. She has embraced both the Cree culture and the western world view. Patricia has addressed numerous audiences across Canada and around the world in the fields of education, justice and health. She is in demand as an authority and an articulate representative of “what can be achieved” and “how to build on Indigenous values and culture” to succeed in this highly competitive world. She is highly respected across Alberta for her knowledge, abilities and her passion to help First Nation Communities become whole again. She works closely with many different reserves, provincial and government agencies, healthcare systems and communities as a consultant. She is relied on by these organizations for her expertise. Patricia is dynamic, educative, funny and always receives high praise for her presentations. Dr. Patricia Makokis is an expert on multiple topics, which include Aboriginal Rights, Canadian – Aboriginal relations, First Nations History in Canada, and Indigenous education. Dr. James Makokis is well grounded in all matters relating to Indigenous cultures, traditions, values, and customs. He is also experienced with the delivery of medical and social services to First Nation communities in Canada. As you probably know, James is a leading role model within the medical and Indigenous community. His keynote address and/or workshop presentation can explore the status of Indigenous health services in Canada and the improvements that are required for long term sustainability. James also can provide information on his struggling years as a youth, and his resiliency to become who he is today. James’ presentations will inspire audience members to become better members of their community through understanding his story, and his experience inside and outside of the aboriginal community. Dr. James will provide inspirational and practical advice on how he was able to achieve so much through his education, culture, spirituality, health, self-confidence, self-motivation, and overcoming adversity. James has overcome bullying in his prior years, is a proud member of the LGBTQ2 community and has faced off with many government leaders, and is at the forefront of a shift in government perspectives on Indigenous rights, healthcare, access, programming, housing, mental health, and social services. James is one of our most outstanding speakers and we are proud to represent him. He has a story like no other and speaks on multiple issues, it is sometimes hard for us to keep up with James! Dr. James Makokis is a leader among the First Nation community and is a primary resource for the government and Alberta Health Service agencies. James would be able to do a keynote or workshop presentation, with plenty Q & A, to inspire audience members through his experiences, education and understanding of aboriginal issues for youth and the importance issues surrounding challenges faced through diversity in the classroom. In his earlier years’, his work was primarily focused on youth, and James still has a passion, and in his own words, “a responsibility” to help Indigenous Youth become all they can be, no matter what their situation. Dr. James Makokis is a very busy man, and we usually need 3 business days to hear back from him for his availability. Janice Makokis is an active lawyer, consultant and Indigenous leader in Canada, like her brother James and mother Patricia. Janice has also Co-chaired the North American Indigenous Peoples Caucus (NAIPC) at the United Nations on the Permanent Forum on Indigenous Issues. Janice is also an active leader within and outside of the aboriginal community. Janice is often called upon to help Indigenous leaders and communities as a consultant on legal and social issues that many communities and individuals face within and outside of the aboriginal community. Janice Makokis, the youngest of the Makokis family, is fresh from participating in legal matters and advocacy relating to the Truth and Reconciliation Commission in Canada. Janice has also overcome many obstacles to arrive where she is today, and her drive and passion for real change within Canada has taken Janice on a path to become a leader, peaceful activist, mediator, teacher, consultant, and role model within and outside of her career which is focused as an advocate for aboriginal rights, education of the white population, social justice and acknowledgment for the past and current treatment of aboriginals today and represents real change for aboriginals and Canadians, that so many individuals and communities are seeking for. She also has worked with youth throughout her career and expresses the same passion and responsibility to aboriginal youth as her brother James. The health disparities affecting Indigenous peoples in Canada might well be understood as a national epidemic. Although progress has been made in the last decade towards both understanding and ameliorating Indigenous health inequalities, very little research or writing has expanded a social determinants of health framework to account for the unique histories and present realities of Indigenous peoples in this country. 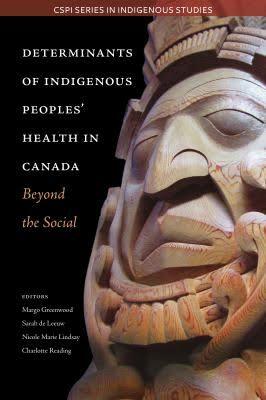 This timely edited collection addresses this significant knowledge gap, exploring the ways that multiple health determinants beyond the social--from colonialism to geography, from economy to biology--converge to impact the health status of Indigenous peoples in Canada. Thank-you for the positive comments and we are truly grateful for your participation. I have forwarded to Natalie as well as she was a very important part of the planning. I hope your travels went well and I hope to take some time to reflect on all of the presentations to see how we as an organization can continue to improve. A beautiful woman to work with; she is very professional, compassionate and dedicated and wise to Indigenous Way of Knowing.